we made it possible for Blogger in Draft users to use their Google+ profile on their blog. This option is now available to all Blogger users, and as a result, we're starting to roll out the first of many Google+ features. Starting today, if you have linked your blog to your Google+ account you will be presented with a prefilled Google+ share box immediately after publishing a post. The share box will contain a +snippet of your post that you can share with your circles on Google+. Of course, you can disable this sharing prompt at any time on the "Settings - Posts and Comments" page. 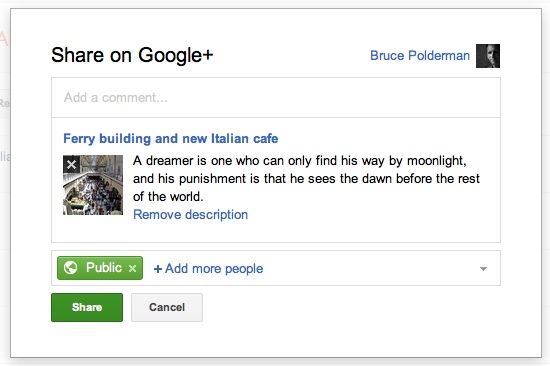 And you can always share individual posts on Google+ by selecting "share" underneath the entry in your post list. You can start using the new Share to Google+ immediately if you’ve already chosen to use your Google+ profile on your blog. If you haven’t yet made the switch, click here to get started. If you don’t have a Google+ account you can create one here, and then log in to Blogger and follow the above instructions. To learn more, check out our FAQs or visit our Help Forum. Want to chat about sharing to Google+ and other Blogger features with someone from the team? Join me on the Blogger +page for a live video Hangout at 3PM PST. Back in October we made it possible for Blogger in Draft users to use their Google+ profile on their blog. This option is now available to all Blogger users, and as a result, we're starting to roll out the first of many Google+ features. At your request, we’re happy to bring you a series of posts with some helpful tips on how to configure AdSense to give you the highest possible return from your blog. 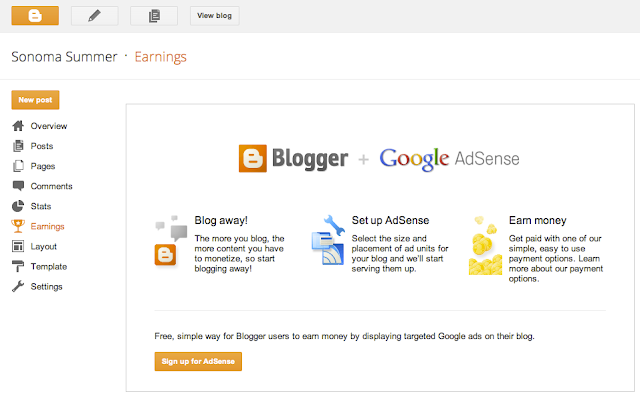 You can easily sign up and start showing ads on your blog, without having to leave Blogger, by clicking on the "Earnings" tab in your dashboard. After completing the AdSense application, the next step is to designate where you want the ads to appear on your blog. Once your application is approved, we’ll start serving ads and you’ll start making money. And unlike many other blogging platforms, Blogger doesn’t take a cut of your revenue. AdSense works by matching text and image ads to your blog based on your content and the types of users that visit your site. For example, if you write about running, your readers may see ads next to your post about running shoes and equipment. Ads are created and paid for by advertisers who want to promote their products. Posting high quality content is the best way to maximize your returns with AdSense. It’s important to take a little extra time defining your topic, creating a post that is engaging and matters to your readers. The more interesting and appealing your content is, the more likely your readers will be to click on the ads on your blog. Stay tuned to the Blogger Buzz blog for more tips and tricks about monetization in the coming weeks. Hi, my name is Andy Chung. I work on the Google AdSense team helping online publishers, specifically Blogger users like you, ensure your blogs are optimized to generate as much income for you as possible.